Huddersfield picked up their first point under new manager Chris Powell as the Championship side were held to a goalless draw by Wigan. The Terriers, who also kept their first clean sheet of the season, went closest when striker Jon Stead saw his late effort saved by Scott Carson. For Wigan, Andy Delort drew a fine save from goalkeeper Alex Smithies in a game of few chances. The point was Wigan's first away from home this season. Uwe Rosler's side are 16th in the Championship with eight points from seven games. Huddersfield, who have not won in the league since beating Reading 2-0 on 19 August, are 22nd with five points. "Considering the way it ended on Saturday, we had a few knocks against Middlesbrough. So the 18 I had tonight were the most senior players available really. "Obviously pleased with the clean sheet because we haven't had one. I'm pleased for Alex Smithies, because you need those - it definitely gets you a point." "Overall we didn't get what we deserved from the game. "We had 15 attempts, 60% possession but we're standing here with only one point. "I was happy with how we shifted the ball and controlled the game in comparison to the Blackburn game, but I'm not happy that we only got a point from the game because we should have won." Match ends, Huddersfield Town 0, Wigan Athletic 0. Second Half ends, Huddersfield Town 0, Wigan Athletic 0. Corner, Huddersfield Town. Conceded by Rob Kiernan. Attempt missed. Emyr Huws (Wigan Athletic) left footed shot from the left side of the box is too high. Attempt blocked. Emyr Huws (Wigan Athletic) left footed shot from the centre of the box is blocked. William Kvist (Wigan Athletic) wins a free kick on the left wing. Foul by Conor Coady (Huddersfield Town). Jacob Butterfield (Huddersfield Town) wins a free kick in the defensive half. Attempt missed. Oriol Riera (Wigan Athletic) right footed shot from the centre of the box is high and wide to the right. Assisted by James Tavernier. Attempt saved. 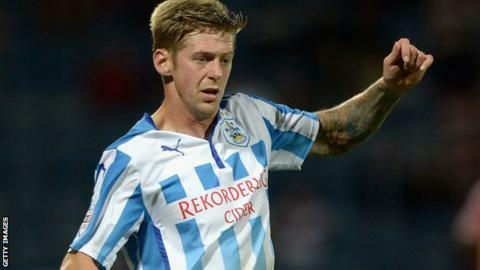 Jon Stead (Huddersfield Town) right footed shot from the centre of the box is saved in the bottom right corner. Assisted by Nahki Wells. Attempt blocked. Nahki Wells (Huddersfield Town) right footed shot from the right side of the box is blocked. Assisted by Jon Stead. Dangerous play by Emmerson Boyce (Wigan Athletic). Murray Wallace (Huddersfield Town) wins a free kick in the defensive half. Attempt blocked. Iván Ramis (Wigan Athletic) right footed shot from outside the box is blocked. Corner, Wigan Athletic. Conceded by Jack Robinson. Offside, Huddersfield Town. Murray Wallace tries a through ball, but Jon Stead is caught offside. Attempt blocked. Don Cowie (Wigan Athletic) right footed shot from outside the box is blocked. Assisted by Emyr Huws. Substitution, Wigan Athletic. Oriol Riera replaces Andy Delort. Substitution, Huddersfield Town. Murray Wallace replaces Joel Lynch because of an injury. Delay in match Joel Lynch (Huddersfield Town) because of an injury. James McClean (Wigan Athletic) wins a free kick in the attacking half. Foul by Lee Peltier (Huddersfield Town). Substitution, Wigan Athletic. James Tavernier replaces Andrew Taylor. Delay in match James Perch (Wigan Athletic) because of an injury. Attempt blocked. Conor Coady (Huddersfield Town) right footed shot from outside the box is blocked. Foul by Don Cowie (Wigan Athletic). Conor Coady (Huddersfield Town) wins a free kick in the defensive half. Attempt missed. Andy Delort (Wigan Athletic) right footed shot from outside the box is too high. Foul by James Perch (Wigan Athletic). Jack Robinson (Huddersfield Town) wins a free kick in the defensive half. Substitution, Wigan Athletic. James McClean replaces Callum McManaman. Callum McManaman (Wigan Athletic) wins a free kick in the attacking half. Attempt missed. Jon Stead (Huddersfield Town) header from the centre of the box is close, but misses to the right. Assisted by Jacob Butterfield following a set piece situation. Iván Ramis (Wigan Athletic) is shown the yellow card for a bad foul. Joel Lynch (Huddersfield Town) wins a free kick in the attacking half.